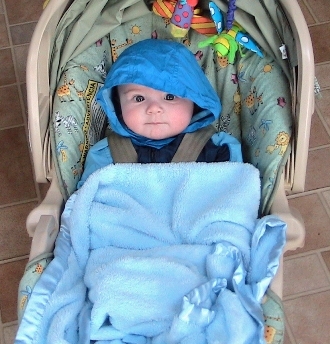 How many layers of protection does the child in this photo have? Coat to prevent against the elements? Check. Securely buckled into an approved car seat? Check. Extra blanket for warmth? Check. A car that has passed stringent safety tests? Check. But the most important layer is the one you can’t see – he is constantly being taught to always buckle up when he is going in a car – by your actions and possibly by your words. We can make our children’s environment safe by using car seats, safety belts, airbags and cars with good crash-test ratings, but unless we teach a child why those things exist and how to use them, we are only doing half the job of protecting them in the future. ‘Layers of protection’ is the buzzword of choice for drowning prevention. It makes sense for exactly the same reasons we teach children to buckle up. Young children are learning self-control and cause-and-effect – our job is to keep them safe while they are learning, but also to teach them how to be safe, and why, at the same time. To keep your child safe around water, here are the basic layers of protection you need. Never leave a child unattended in the bathtub. Personally my rule-of-thumb is that they must excel on a swim team or choose to shower instead of bathe before this rule ends. If you have a pool, fence the pool. Not the yard, the pool. Look at installing self-closing gates, door alarms and pool alarms as an added layer of protection. Safety Turtle is a great portable choice for holidays and trips to Grandma’s. Always watch your child near water. Assign an adult to be a ‘Water Watcher’ for 10 minutes, give them a whistle, badge or a sign to hold to remind them that their only job is watching the kids, then rotate so that no one loses focus or misses out on the adult fun. Empty and turn over buckets, wading pools and anything else that can collect water. Think about covering any ornamental pools or bird baths while your children are under 5. Learn CPR, because drowning happens in under 2 minutes in under 2 inches of water. Accidents do happen. Your local Red Cross or Park District will have classes. The most important layer though is teaching your child how to be safe around water. Talk to them about why there are fences, why you are watching them, why they need an adult around whenever they are near water – back up your actions with explanations. 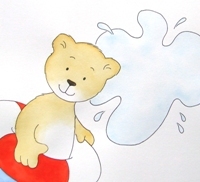 There is a book about water safety that young children (under 5) love, that can help you with this conversation. It’s called ‘Jabari Makes A Splash’. With everyone of these actions you are sending two positive messages that will keep your child safe their whole life: Water is fun and you need to act responsibly and safely around water. Jabari, which means “brave” in Swahili, is a cute and lovable lion cub. Like most young children, he’s energetic, enthusiastic, curious, and sometimes even a bit mischievous. But Jabari always wants to do the right thing. Children will easily relate to him and want to emulate his positive behavior. Through Jabari’s stories and adventures, children will learn how to be safe in the water. And parents will learn the biggest lesson of all: Always watch your children while they’re in the water. ‘Jabari Makes A Splash’ is available on Amazon.com or at www.jabariofthewater.com. Nice post! This is very useful tips especially those who had a baby it can help a lot to them..Thank you for sharing inspiring and very informative post..